Oh dear, now we're getting closer to home I'm getting lazy with the blog again. Though to be fair whilst a delight to cruise this section of the T&M is not very note worthy and for some reason we took very few photos of this section. We did have a visit from eldest daughter Amy armed with a mound of post and parcels last night. One of which was a new harness for Smudge as we feel he had out grown his old one. The new one has a good handle to grab him if needed and the lead loop is really strong. It is also fully adjustable so should last him a good while. After finally completing Heartbreak Hill and descending Kings Lock we found a hire boat in front turning into the junction. With boats moored on the water point I hovered mid channel until Chris gave me the all clear to proceed. Unusually there was no sign of traffic coming down from the Middlewich Branch so after resetting the lock after the hire boat it was our turn and I swung into what is the shortest canal on the network and into Wardle Lock. The canal here was built in 1829 so that the navigation authority of the Trent and Mersey Canal could maintain control over the junction. Wardle lock or more commonly, Maureen's lock, is next to the lock keeper's cottage where boat woman Maureen lived. I remember our hire boat days chatting to Maureen whilst we passed through here, she was such a lovely, cheerful lady. Sadly she passed away on 2012 but there is a plaque at the lock in her memory. We found the moorings above the lock surprisingly empty so pulled in for the night on the first set of visitor's moorings. In the evening we took ourselves off to the local Tesco for some bread and milk. 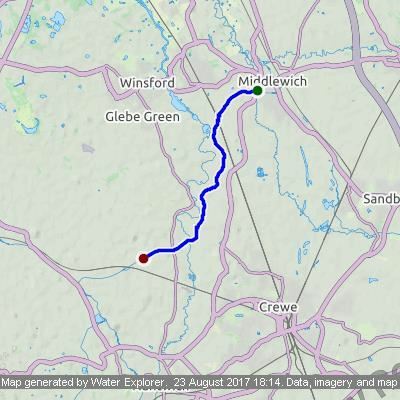 Today we continued our journey along the Middlewich Branch. Traffic today has been best described as heavy. So many boats on the move in the other direction. 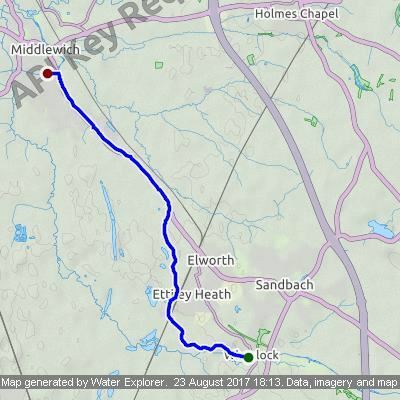 According to Wikipedia this Branch of the Shropshire Union Canal runs between Middlewich, where it joins the Trent and Mersey Canal, and Barbridge Junction, where it joins the main line of the Shropshire Union Canal. It is 10 miles (16 km) long, and was planned as part of the Chester Canal, which was authorised in 1772, but the company ran out of money, and construction did not begin until 1827. The Trent and Mersey insisted that there should be no direct connection at Middlewich, and instead built the short Wardle Canal to join the two, charging large compensation tolls for traffic passing along it. The canal became part of the Shropshire Union system in 1846, which was taken over by the London and North Western Railway within a year. Traffic on the branch was always limited by the compensation tolls, and it was not until 1888 that they were abolished. Along the way we did see a novel way of rounding up cattle at one farm as we passed. Days of one man and his dog seem to be replaced with one lad and his quad nowadays. The lad was charging around the herd, who must be quite used to this as they stood their ground and took quite some cajoling to move along. Considering the amount of boats we'd had heading towards us we steeled ourselves for a big queue at Minshull lock which is the norm for this time of year. This was the scene that greeted us. Not a boat in sight and one leaving the lock ahead of us! Having gone through plenty of locks this trip Smudge is now well versed with locking procedures and stands watch casting a critical eye over AmyJo as she enters the lock from the lock bridge above. He then checks everything is OK with a glance at Chris then helps close the gates though he does get under Chris's feet tangling her in his lead at times. Keeping watch to make sure we get in the lock OK.
We found some lovely moorings with Picnic tables in the sunshine so pulled in for the day. We then sat out in the cratch watching all the boats go by.